Governor Palin and Ted Nugent campaigned for John Raese in Charleston, West Virginia today. Raese is running against Democrat Governor Manchin to fill the last two years of the Senate seat left by Senator Robert Byrd when he died at age 92 in June. Gil McClanahan of local 13WOWK reported on the event and included several photos of the event which can be found here. More than 2,700 people came to Haddad Riverfront Park in Charleston to see a former Republican Vice-Presidential candidate and a rock legend. 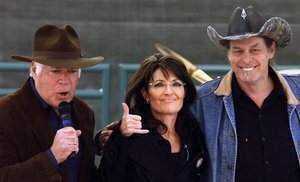 Sarah Palin and Ted Nugent campaigned for Republican senatorial candidate John Raese Saturday afternoon. Palin took the stage first and told the crowd Raese’s opponent, Gov. Joe Manchin is now trying to distance himself from President Barack Obama. She says Raese would work for West Virginia. Nugent then told the crowd that he wanted to rid Washington of all the pests. He also praised Raese, calling him his blood brother. Both spoke for about an hour. Sarah Palin says Democrat Joe Manchin is a good governor – but she says West Virginia voters should keep him in the governor’s mansion and out of the U.S. Senate. Palin, the former governor of Alaska and one-time vice presidential candidate, was in Charleston on Saturday to support Republican John Raese (RAY’-see)’s Senate bid. She drew cheers when she said Manchin was a better fit as governor. Rocker Ted Nugent also was on hand, entertaining the crowd of several hundred with an electric guitar solo of the national anthem. He told the crowd that democracy is a participatory sport and they can’t afford to stand on the sidelines. Politico has reported that Governor Palin’s robocall for the Faith and Freedom Coalition is reaching millions of people just before the mid-term elections next week. Ralph Reed’s Faith & Freedom Coalition is sending a Sarah Palin GOTV robo call to 8.5 million social conservative households this weekend across 56 congressional districts and in 14 states with competitive Senate and gubernatorial races, POLITICO has learned. The largest call universes are in battleground states Ohio, Pennsylvania, Colorado, Florida, Illinois, Washington, Nevada and Wisconsin. It’s the same message across the country, but is tailored to each state. “Hellooo Pennsylvania, this is Sarah Palin urging you to go to the polls on Tuesday or, even better, vote early,” she says in the recording. “We have some simple choices this year. America needs a return to conservative, common sense and time-tested truths. We need leaders who believe in smaller government, lower taxes, stronger families and a robust, unapologetic national defense. “The momentum is on our side, but it isn’t over until the polls close, so please go to the polls and vote for the candidates who share your values. Urge your friends and family to vote, too. The third-party outfits doing TV ads have gotten significant attention, but Reed’s group is doing a massive voter-turnout operation that will include millions of mail pieces and voter guides aimed at social conservatives.